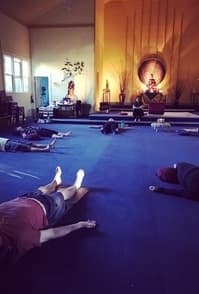 A couple of months ago, I was invited to attend a breathing workshop. I recalled reading that deep breathing had the power to increase vitality and wellness and restore a sense of calm, so I was curious to find out more. The workshop was one of the most liberating experiences I’ve had the pleasure of attending. Liv: Pranayama has been around for some time. How did you come to combine it with addiction treatment? Jennifer: Our CEO and founder, Eric Duffner, found this particular breath technique when he was in treatment himself. He had been battling with the demons of addiction for a long time and had struggled to stay sober. At one juncture in his recovery, he was resistant to the twelve-step program, but very open to the practices of kundalini. One day in his sober living, a man came in and was facilitating a breathwork group for the men in his house. Eric was more open and receptive to fully participating in the group based on his experiences in kundalini. His breathwork experience was life changing. The healing experience enabled Eric to cry for the first time in fifteen years. Eric talks about the impact of that experience and how his once calcified heart started to crack open that day. After his breath session, he had a powerful vision to bring this healing modality into the mental health and treatment industry. And that single event was essentially the birth of Breathworks Connection. Liv: What are the benefits of pranayama for people in recovery? Can you start at any stage of recovery? Jennifer: I believe whether you are in recovery or not, the breathwork meditation has its benefits for all. This type of pranayama meditative breathing can help with depression, anxiety, post- traumatic stress and help calm the nervous system. I feel so often that we get bogged down by the chatter in our minds, obsessive thinking, worrying, stress etc. that we lose sight of who we are at our very core. What we are really trying to do is eradicate the ego, so the client can reach a higher state of consciousness. This type of meditation helps turn down the volume in the conscious and let the subconscious come to the forefront. Yes, you can start at any level of recovery and/or level of care. Levels of care we provide our services to are: detox, RTC, PHP, IOP, OP, and sober living. We do hesitate to provide our services to those who are in their first of week of detox from alcohol and benzodiazepines. We feel that, for safety reasons, it is best to wait until the client has fully detoxed. We also provide community events so that all people, in or out of recovery, can participate in this type of healing work. Liv: Can you describe any transformational experiences you have seen as part of this practice? Jennifer: There have been many transformational experiences that I have witnessed because of this practice. Not only my own and those on the breathworks connection team, but also hundreds of clients that we have helped guide through this practice. As much as people are drawn to success stories of the reluctant or resistant participants, I have always been so drawn to the stories of deep healing. Meaning everyone’s story. This work is the participation in one’s own healing, and so anything that happens on the spectrum or within that scope feels significant to me. There is a particular instance I can think of that was significant to me. 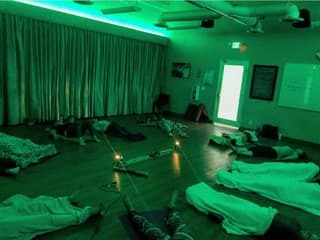 I was working in Orange County and running a breathworks group at a men’s detox. I had about fifteen guys participating in the meditation that morning, but I had one client tucked away behind a couch. You can never tell what type of experience a client is having, based on what they look like, when they have their eyes closed, and are breathing. To be honest, I thought he was not participating at all. I thought he was sleeping. After the meditation the man got up and scurried out the room crying. I was not sure what happened and asked the staff what was going on. They proceeded to tell me that during the pranayama meditation the man saw his brother who was shot and killed. The trauma of that event came up for him, hence why he was so emotional. I felt a little saddened that I was not able to process this with the client, but everyone needs to process their experiences differently. I always tell my clients that ‘healing does not always feel good’. With that said, I also feel that these situations are delicate, and we should give space to those who are doing the work and processing their experiences. I came back the next week and apprehensively asked the client if he was going to breathe and participate in group. He enthusiastically said, “oh yeah, I’m breathing today,” and I was shocked. I have had clients in the past have intense experiences and be unwilling to keep pushing through their healing. The second time I took the client through the meditation experience, halfway through the session, the client started smiling. I started smiling and was so curious to know what he was experiencing. After the session concluded, I processed with the client about his experience. He said that he saw his brother again in his breathwork. He said that his brother was in a good place and that everything was okay. It was an emotional moment for both of us. I felt such a sense of relief and peace of mind in that man that day. It was truly one of my most memorable experiences. As facilitator it is indescribable how fulfilling and gratifying the work is that we do. I will forever carry that man’s story with me. Liv: What motivated you to become a facilitator/teacher of pranayama? Jennifer: I have been in recovery for over seven years. 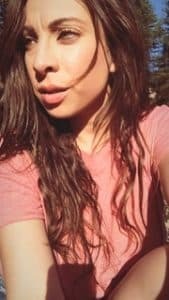 About a year ago I reached a point in my own personal journey where I wanted to explore holistic healing as well as a deeper level in my spiritual growth. I was not sure what avenue I wanted to pursue but I knew that I wanted to expand my horizons and help others in a much deeper capacity. When I experienced breathworks for the first time, I knew that this was my calling. That this modality of healing would become a part of my life’s work. My journey started when I met a woman by the name of Alison Hord, at my girlfriend’s son’s one-year birthday party. My friend had the intention of linking her and I for some time but somehow this was the moment when our paths would cross. I casually asked her what she did for a living and she said I am a breathworks facilitator. She briefly explained what that meant but the most significant thing she said to me is, I think you would be good fit for this work, “you’re a healer.” She saw the gift in me before I could see it in myself. I felt drawn to this woman and was so curious to experience this breathwork. The meeting happened at a time in my life where I just felt open. I felt open to the possibility of something greater coming into my life. I know now that breathworks and being a part of such an amazing team was divinely inspired. I feel that I am meant to give this gift away and help others heal themselves. Liv: I recall you describing a powerful experience as part of your breathworks training. Can you describe that to us? Jennifer: The first time I ever did breathworks I went to go shadow my good friend Alison Hord. She has been my mentor through my breathworks journey and had me come shadow her at a rehabilitation facility, as she facilitated a group. There were only two girls in group that day and she encouraged me to lay down in the group and do the breathworks meditation. To be honest, I was nervous. I did not know what to expect and by our discussion about breathworks, I knew that whatever was about to happen it was going to be powerful. So there I was, laying down in this small room, opening myself to an unknown experience. Within the first minute or two, my body was completely activated. Meaning my entire body was vibrating and tingling. I had never felt a sensation like this before in my life. I started feeling my body sink into the floor, as if in a state of euphoria, I would completely fall into the center of the Earth. As the session went on, the feelings intensified. I started feeling emotions come to the surface. I started having visions and colors but above all else, I felt a real sense of inner peace, connectedness, clarity and oneness. It became very clear to me that day, that this type of healing was a true calling and that this would be my journey. Liv: How can we find a breathworks class? Jennifer: Breathworks Connection has just recently expanded to the Portland area. We are currently working on creating spaces and events that the community will have access to and be able to participate in. People can follow us on our Instagram or on our website, to keep current on events that our happening around and within the Portland area. Liv: If there is no class available, how might one practice this by themselves? Jennifer: Anyone can practice the breathwork technique in the comfort of their own home. You can simply make a playlist and breathe for as long as you want. At a minimum, I would recommend breathing for seven minutes. Then follow the simple transformational breath technique. The technique is two inhales and one exhale all done through the mouth. One deep inhale through the stomach, one deep inhale through the chest and then an exhale through the mouth. Continue the breathwork for the entire duration of the time you have allotted. Increasingly deepening and speeding up the breaths, if possible. After the time is up, I would take five to ten minutes to meditate. I usually will pick a few soothing songs to do this to. After the breath session comes to an end, it is encouraged to process whatever has come up in the work. Writing, talking or seeking counsel would be recommended. The Breathworks Connection team has a few YouTube videos that show exactly what we do and the testimony of those who have experienced the work.